Knee pain is one of the most common patient complaints physical therapists and athletic trainers have to deal with. A growing clinical consensus agrees that low-impact exercises are an essential component of knee conditioning programs, both for patients recovering from surgery as well as for osteoarthritis and other chronic pain sufferers. With a HydroWorx therapy pool for knee rehab, your patients can take advantage of one of the most sophisticated aquatics devices on the market today. Osteoarthritis: Chronic knee pain is one of the persistent and frustrating effects of osteoarthritis. For many patients, it affects their ability to walk and their overall quality of life. Recent research suggests knee conditioning programs containing an aquatic therapy portion have more positive outcomes than wholly land-based PT. A joint study from the University of Florida’s Department of Applied Physiology and Kinesiology and the Physical Education and Recreation department at Utah State University found “an acute training period on an aquatic treadmill positively influenced joint angular velocity and arthritis related joint pain” for patients suffering from osteoarthritis in the knees. Increased buoyancy in water relieves pressure on the knee, allowing it to become stronger without the risks associated with high-impact therapy. Warm water decreases sensitivity to pain and improves circulation and range of motion, making underwater knee rehab ideal for patients with chronic conditions. In a HydroWorx pool, water resistance and direction can be easily controlled, allowing clinicians to create a level of resistance appropriate to the rehab needs of their patient. Aquatherapy presents a safe environment in which patients can exercise with a lower risk of re-injury. 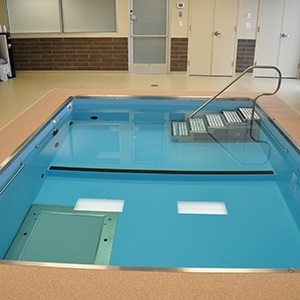 For patients with severe mobility problems, HydroWorx 2000 and 1200 Series pools feature an adjustable floor for facilitating entry and exit without steps or ladders. Offering aquatherapy for knee rehabilitation opens a whole new revenue stream for your facility. Your clients’ recovery times will improve, allowing you to grow your business by taking on new patients. If you’ve been considering adding a therapy pool for knee rehabilitation to your facilities, but aren’t sure if the expense is worth it, please contact HydroWorx today to request your free business plan and ROI calculator. Each day, over 23,000 people use HydroWorx products at some of the world’s top training centers, hospitals and professional sports organizations. Your facility can be the next one to tap into the growing market for aquatherapy — contact our team today for more information.